What I didn't include is what else I learned that day. 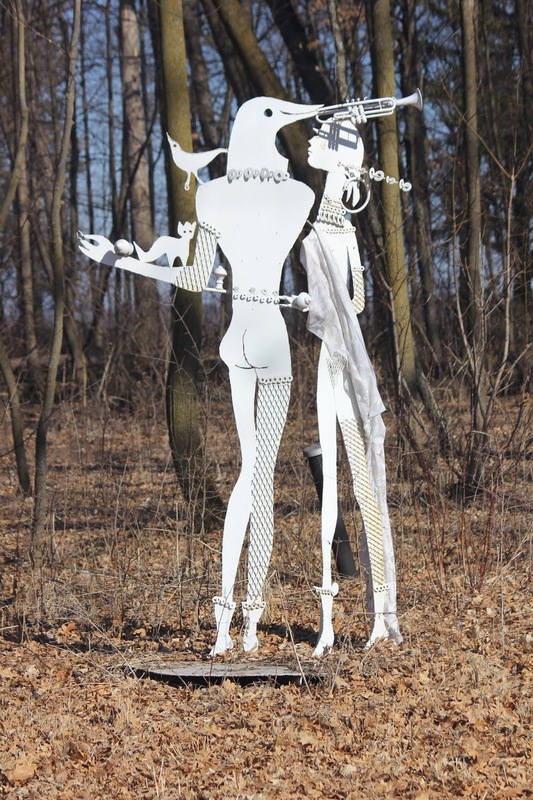 As we drove onto the property for the tour, I noticed several metal sculptures in the landscape. I had seen these from the road for many years, but I never took the time to find out about them. Apparently this was the home and property of Lester Schwartz, and it was his daughter and her husband who created the informative maple syrup tour. I learned that Les Schwartz founded the art department at Ripon College and was a famous artist. He was the Artist in Residence at Ripon College for many years. At his home, near Green Lake Wisconsin, he built large scale sculptures made from scrap metal. His sculptures were inspired by his travels and his love for the circus. He named the sculpture garden "Gloria Hills" after his late wife. Lester died in 2006 and the park is no longer open to visitors. Hopefully some of these sculptures can be preserved and moved to a park, to the Town Square in Green Lake or better yet, to the Ripon College campus. Moving them may be a huge project, but they should be available for people to see on a regular basis. I don't know the name or history of these sculptures but they were very interesting.